Tigers coach Daryl Powell: "We were never convincing." Castleford TIgers coach Daryl Powell praised his left-flank attack after two tries a piece from Denny Solomona and Jake Webster helped Castleford Tigers to a 30-22 win at Huddersfield Giants on Friday night. The Tigers bounced back from the previous week’s home defeat against Wigan Warriors with a five-try victory. Super League’s top try scorer Solomona’s double took his total in the last six games to 11 and his season’s tally to 22. Powell felt it was a “scratchy performance” but he added: “I thought we were really good defensively in the first half before a couple of smart tries put us ahead. “We were never convincing but the most important thing is that we got the two points which keep us in touch. “We are going to have to string some wins together (to reach the top four play-off contenders) but once you have made the top eight, all it needs is for you to string a few wins together and you are right up there. “Junior Moors is very strong and probably playing the best football of his career and creating lots of problems, whether it’s through his skill-set or physical prowess. “Denny Solomona scores tries for fun, whether it’s getting up for kicks - he’s certainly good at that - or finishing in the corner and he’s exceptionally quick as well. “Scoring tries is his job - he gets paid for that - but he does it very well. “But a lot is to do with the service he gets from the inside, from Jake Webster or Luke Gale or Junior Moors. 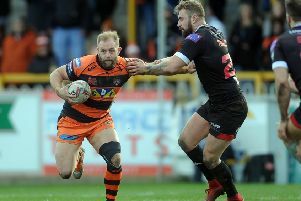 Gale scored a try and kicked five goals to celebrate extending his contract at the Mend-a-Hose Jungle until the end of 2021, to at one stage help open up a 30-10 advantage. Ryan Brierley and Jake Connor added late tries to first-half efforts from former Cas half-back Jamie Ellis and Leroy Cudjoe, while Ellis kicked three goals but the defeat is another blow to Huddersfield’s fading hopes of making the top eight.